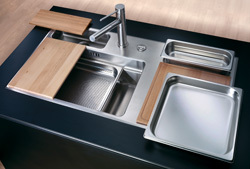 Rieber is one of the leading suppliers of household sinks in Germany, manufacturing in a range of shapes, colours and materials, for fitting, flush-mounting and for sub-counter mounting. Rieber’s CUBIC offers the best of German design, featuring two working levels in the main basin, which saves space and provides great flexibility. Cubic fits a 600mm base (540 x 332 x 180mm) and is beautifully manufactured featuring small radii corners for easy cleaning. Rieber also offers the Waterstation® Round, a novel design solution which creates a central focus for the kitchen. Providing the equivalent of around 3 metres of work surface, Waterstation Round takes up just 0.8 m&sup2; of floor space.